Situated in 28 acres of beautiful surroundings is the Osho Meditation resort. If you know nothing of Osho then I urge you to take a look at his XXXBiogrpahyXXX when you get a chance. This place is truly magical. Just take a look at the photos and you can see what I cam talking about. This place is not a retreat high in the mountains far away from civilization but an actual holiday resort. Time here slips away into a blissful dream. I don't think a more relaxing place exsists on earth. 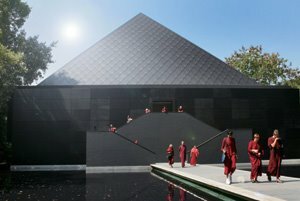 Beautiful achitecture, swimming pool, marble pathways and tennis courts the Osho meditation resort is a place unlike any other. But this Osho is not all about being relaxed, for that you can trip down to Palolem. This is a place with serious spritual identity. There are loads of different meditations to do all the time in several different venues or if you want just chill out by the pool, attend a workshop, have a massage and learn to dance bollywood style. There really is no reason to leave once you're there! Here are a small selection of the most popular osho meditations. Unlike traditional 'Sitting and watching' meditations like vipasna, Osho designed meditations to be active so be prepared to dance, sing, twirl and generally make yourself look stupid! (It's not as bad as it sounds)!